Monitoring and cutting calories is essential when you’re trying to lose weight. After all, consuming too many calories is one of the key reasons you're likely to gain weight. But paying attention to calorie intake isn't important only when you're trying to shed extra pounds; it's also a must for maintaining your weight. Several factors determine how many calories you should eat daily. A calorie is the unit of energy in food. However, a single calorie is a very tiny unit, so the “calories” often referred to in the context of food are really “kilocalories.” One kilocalorie is the amount of energy or heat needed to increase 1 kilogram of water by 1 degree Celsius, or about 35 ounces of water by 1.8 degrees Fahrenheit. Scientists use various formulas to estimate daily caloric needs. One formula relies on three factors: weight in kilograms; basal metabolic rate, which is based on gender; and activity level, which ranges from sedentary to "exceptional." Other formulas also take into account factors such as age and height. To estimate how many calories you should consume daily to support basic metabolic functions such as sleeping and breathing, first determine your weight in kilograms -- divide your weight in pounds by 2.2. Next, multiply your weight in kilograms by your basal metabolic rate -- 0.9 if you’re a woman. Multiply that total by 24 to estimate your daily basic caloric need. Once you know your basic daily caloric need, you can use it to determine the extra calories you should consume based on your activity level. Activity levels are sedentary, light, moderate, heavy and exceptional; and each activity level has a corresponding activity level factor. For women, the activity level factors are sedentary, 0.30; light, 0.50; moderate, 0.60; heavy, 0.90; and exceptional, 1.20. To determine the number of calories you need to support activity, multiply your basic caloric need by your activity level. Add the result to your basic caloric need to estimate the total number of calories you should consume daily. If you sit around a lot and are rarely physically active, your activity level is sedentary. If you engage in some physical activity, for example housekeeping or playing table tennis, you have a light activity level. People with a moderate activity level do things like bike riding, brisk walking or dancing. Those with a heavy activity level may play basketball, do fast running or have a job involving physical labor. Professional athletes who train for several hours daily have an exceptional activity level. If your weight is 140 lb., in kilograms it’s 63.6. 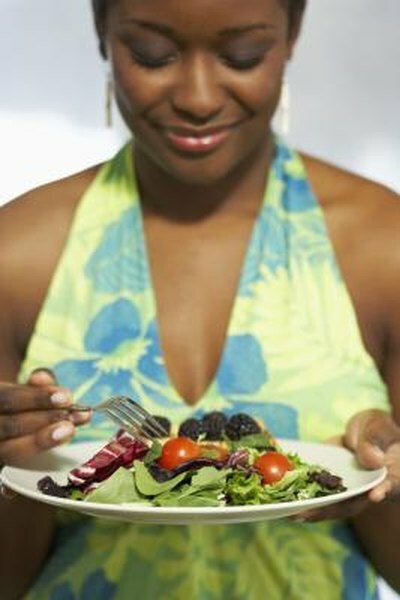 As a woman, your basal metabolic rate is 0.9, so the number of calories you need per hour is 63.6 multiplied by 0.9, or 57.24 calories. Your estimated basic caloric intake for 24 hours is 1,373.76. If you have a moderate activity level, multiply your basic daily calories need by 0.60 for a total of 824.25. The estimated total number of calories you should consume daily would be 1,376.76 plus 824.25, or 2,201.